“It’s harvest time on the farm and in our lives” - These words come from our degree work and has true meaning to all of us. Whether we live on a farm, have gardens in the backyard, or have this feeling in our daily encounters. This is why I love the Grange. Every phrase or script of our ritual can relate to every person in this country. It is a simple language that anyone can understand, interpret and follow. Yet many Grangers never heard this phrase, we have welcomed them into our order, but have not given them the needed lessons to really understand what the Grange really is about. I challenge our Lecturers to include a Ritual Night to educate and remind members of what the Grange really means. Make it fun, have a scavenger hunt, team competition, word search, debate, or anything that gets members up and out of their chairs and reflect on their past experience with the Grange. It’s back to school for our little ones. Hooray… some parents are proclaiming. It’s that time when Grange work begins. State Session is around the corner. Did you get your resolutions in on time? Have you filled out your Honor Grange report? Did you submit a name for outstanding farmer; nominate a Granger of the Year? Time is running out, the deadlines are near, jump to it before it’s too late. This year at State Session it is an election year for the officers of the Connecticut State Grange. I hope that I have met the requirements for being your State Master, and hope members are willing to take offices in the State Grange officer corps if openings are there. It can be difficult work but also rewarding to you. Many events have happened in the State of Connecticut this past year with the budget deficit, layoffs, reduction of State Aid to local towns. A new threat has cropped up for our agricultural lands, open spaces and forests. They are being gobbled up for Solar Farms. In the northeast, dairy farmers are losing land they have planted in corn for years to acres of solar panels harvesting the sun’s rays. New projects being presented have vast old growth timber being clear cut to plant fields of solar panels. This is the new revenue recovery plan, as were cell towers a few years ago. I find our best resource is land that we can till for food production, but once they are developed then it is lost. I remember as a kid, the Connecticut River Valley in South Windsor, East Windsor, Enfield, Ellington, had topsoil two feet deep with lush soil for growing vegetables, tobacco, and corn. Then they built up the Route 5 section for car dealerships, warehouses and truck terminals. All that land is lost yet you still see little patches of farmland cultivated in those areas. If it continues, where will our dairy farmers get the land to raise the corn to feed the cows that make the milk that gives us the cheese and ice cream and milk to enjoy? We must look into this trend and come up with a plan or our farmers will be in trouble. Many solar farms can be built in those paved areas that have been abandoned or vacant for years rather than destroy our natural resource. Think about it. 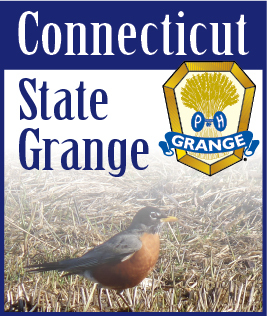 At State Session we will have a resolution on the role of Pomona Granges in Connecticut. I hope every Grange has been talking about this so we can get a plan in place to resolve what our Pomona Granges do. I hope there is plenty of thought and good conversation on the topic. Hope to see you all at State Grange Session.